Kasuotang Pilipino 2016 will showcase the creations of 14 designers, all Makati-based. They are Therese Andaya, Albert Andrada, Niño Angeles, Ronaldo Arnaldo, Joel Bautista, Janet Castro, Noel Crisostomo, Frankie de Leon, Luis delos Santos, Albert Figueras, Jinggo Inoncillo, Kaye Morales, Raymund Saul, and Val Taguba. For Luzon, the creations will be modelled by wives of diplomats, namely, Eloisa Klecheski, wife of the deputy chief of mission, United States Embassy; Anjana Hasper, wife of the charge d’affaires, German Embassy; Souddavone Khaykhampithoune, wife of the ambassador, Embassy of Laos; Monthip Upatising, wife of the ambassador, Royal Thai Embassy, Sylvia Tay-Van Remoortele, wife of the ambassador, Royal Belgian Embassy; Dr. Kieu Phung, wife of the ambassador, Royal Danish Embassy; and Wang Qi Jessen, wife of the ambassador, European Union Embassy. The other models for Luzon consist of Councilors Virgilio Hilario, Jr. and Concepcion Yabut; Barangay Captains Michael Infante, Fernando Bolo, Restituto Cajes and Martin John Pio Arenas; Joy Gaviola; Dr. Rosario Duque; Dwayne Samarista and Ryan Barcelo. For Mindanao, creations by Ben Farrales will be modelled by Councilor Nemesio Yabut, Jr.; Barangay Captains Benhur Cruz and Jeline Olfato; Kagawads Saira Margarita Nepomuceno and Susannah Patricia Infante; Olive Caray, Geraldine dela Rosa, Dr. Dalisay Brawner, Vissia Marie Aldon, Dr. Amelia Paje, Engr. Reynaldo Paredes, Jimmy Bacamante, and Rolando Medina. Kasuotang Pilipino is organized by MCAO, in collaboration with the Liga ng mga Barangay and Ayala Malls. Last year, some 12 Makati-based designers featured their signature styles at Kasuotang Pilipino through traditional costumes in Luzon, Visayas and Mindanao. 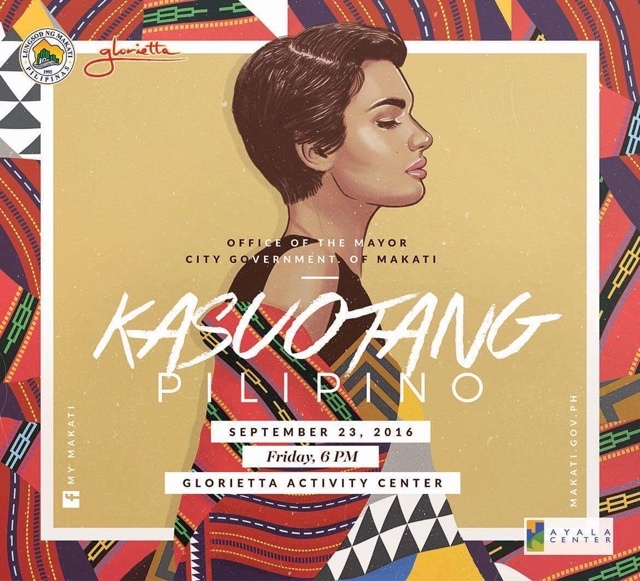 In 2000, the first Kasuotang Pilipino Fashion Show was formally staged in Makati City, in line with Proclamation No. 241 that was signed by former president Fidel V. Ramos in 1993 mandating the observance of the “Linggo ng Kasuotang Pilipino” every September.